The Department of Homeland Security is advising Jewish communities and offering protective measures, a statement said. WASHINGTON: The US authorities on Wednesday offered support to Jewish communities in the wake of a series of threats and attacks since President Donald Trump's election in November. The Department of Homeland Security (DHS) is advising Jewish communities and offering protective measures, DHS Secretary John Kelly said in a statement issued late in the day. "DHS has Protective Security Advisors in all 50 states who serve as liaisons to government, industry and community leaders, and who provide expertise on protective measures, threat reporting and security awareness," he said. The advisors will offer support "in terms of training, protective measures, exercises and information sharing." Counterterrorism experts have also provided Jewish communities information about available federal help, Kelly added. It includes "facility vulnerability assessments, as well as assistance to connect organizations with active shooter preparedness and bombing prevention training and guidance, tabletop exercises, protective measures, guides and other tools to strengthen security," he said. At least 100 Jewish community centers and schools in 33 states have reported bomb and other threats since the start of the year. 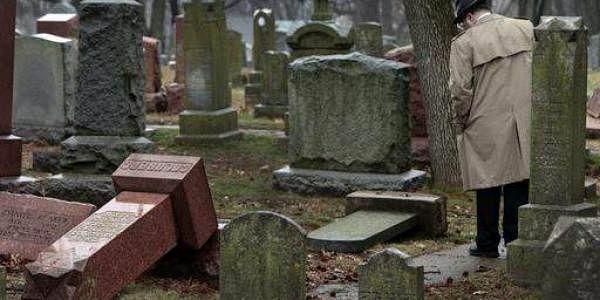 Last weekend, vandals broke and overturned more than 500 gravestones at a Jewish cemetery in Philadelphia. The attack came a week after more than 100 headstones were damaged at a Jewish cemetery in St Louis, Missouri. The incident prompted a visit by Vice President Mike Pence. After remaining silent on the Missouri attack for several days, Trump decried the anti-Semitic threats as "horrible" and "painful" last week. However, concern is rising about his embrace by white supremacist groups and an "alt-right" movement given a platform on Breitbart, the online news outlet once headed by Trump's chief White House strategist Steve Bannon. The White House also raised eyebrows on International Holocaust Remembrance Day late last month by issuing a statement that made no mention of the six million Jews killed in the Nazi genocide. During a speech to Congress on Tuesday, Trump criticized the recent threats against Jewish community centers and condemned the apparently racially motivated killing of an Indian immigrant in Kansas City. He said those attacks "remind us that while we may be a Nation divided on policies, we are a country that stands united in condemning hate and evil in all its forms."